What's going on around here? Why hasn't anyone posted to this blog? I wish I knew the answer - oh wait, I do - it is summer. I have two kids that are home everyday. One of which no longer naps. Both of which wake up before 7AM. I've also just felt uninspired. I've just felt really "blah" lately. I'm not sure if it is lack of sleep, or the fact that I just don't use my brain for most of the day, but I just have been feeling like I can't put two thoughts together. I was starting to lose sight of why I write this blog. I was starting to think things like, "Who cares if Max is eating finger foods" or "So, Charlotte wrote her first letters yesterday - who wants to read about that?" Then, the 2009 & 2010 blog books arrived at my door last night and this morning. I opened the boxes and slowly opened the books. They are beautiful and I couldn't love them more. 3 years of our lives documented. Almost 600 pages of the story of our family. Books that Charlotte and Max will read when they are older, maybe with children of their own, and know all of the little details of their childhood. Now I remember why I write this blog. I'll write about whether Max is eating finger foods or not. I'll write about Charlotte being so proud of herself that she wrote an "H" and an "S". It doesn't matter if anyone reads this or cares about it. Because I care about it and one day so will they. So, I'm back on the blogging wagon. Get ready for some posting - if anyone is actually still reading. 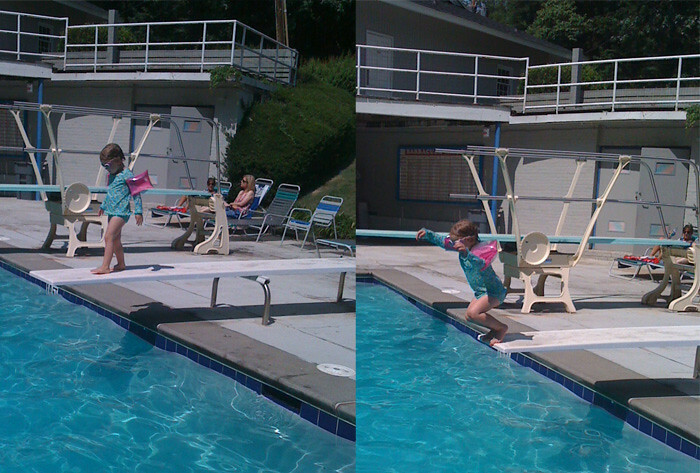 Oh - and guess who strapped on arm floats, adjusted her goggles, and jumped off of the diving board for the first time yesterday? My brave, beautiful girl. We care! We're all still reading!